Voter caging is a term that drew public attention as a result of testimony provided by Monica Goodling, former White House liaison to the Department of Justice, to a 2007 House Judiciary Committee hearing on the firings of eight US Attorneys. Although public interest in voter caging is relatively recent, the practice is not new. Republicans have engaged in voter caging on the national and state level since the late 1950's. According to many election observers, voter caging is a controversial political tactic that typically targets minority voters to directly disenfranchise them or suppress their vote by intimidation. Republican officials, on the other hand, maintain that voter caging is part of what they describe as "ballot security" measures necessary to combat voter fraud. The following report reviews Republican voter caging operations during the last 50 years, culminating with the unprecedented number of large voter caging operations conducted across the nation in the 2004 presidential election. 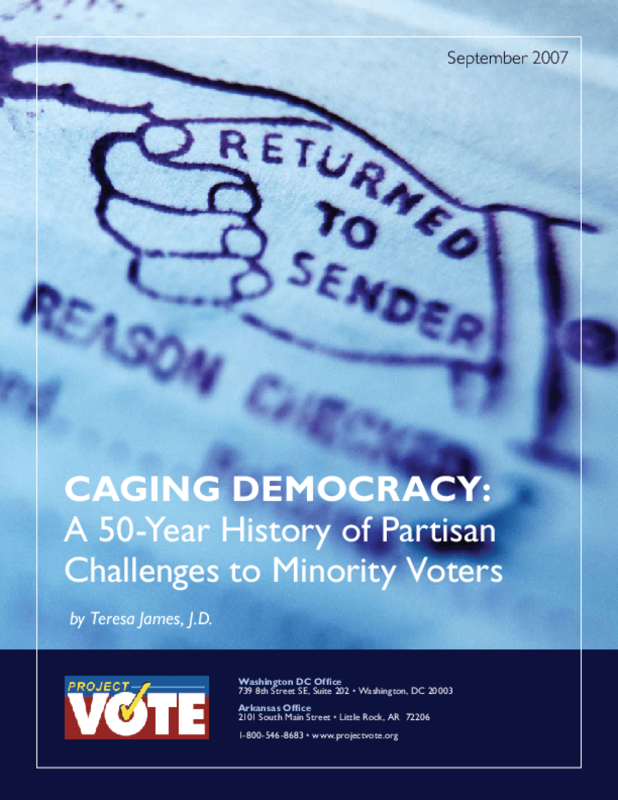 The report briefly covers the origins and history of voter caging and follows with a survey of individual caging operations during this 50-year period.